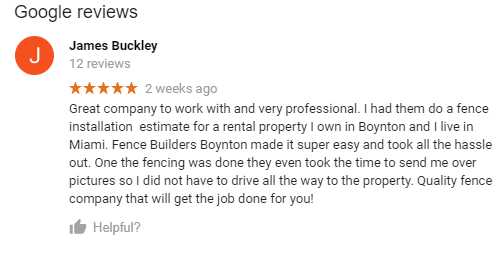 Fence Builders Boynton Beach is not only a fencing company. We are way more! Our drive to make sure every single project we have is beyond our customer’s expectations and we ensure property value will only go up! With our dedicated team of professionals, we take pride in the projects we complete. Your happiness and security is what we base our success on. By including you in every step of the way, we offer a higher level of services than our rival fence companies. We keep in contact with each and every customer's, from the first phone call to the last hand shake. If you are ever in need of a new fence, repairs, or to get an estimate, we are the #1 phone call to make. We make sure every project is perfect because your happiness drives our success. Your relationship with us creates an atmosphere of accomplishment and appreciation, which motivates us to work even harder. Without you, our loyal customers, we cannot create a community of fast-achievers or security. If you don’t believe us, read our happy customers’ raving reviews below.